Also known as symptomatic solutions, a superficial solution attempts to solve an intermediate cause rather than a root cause. 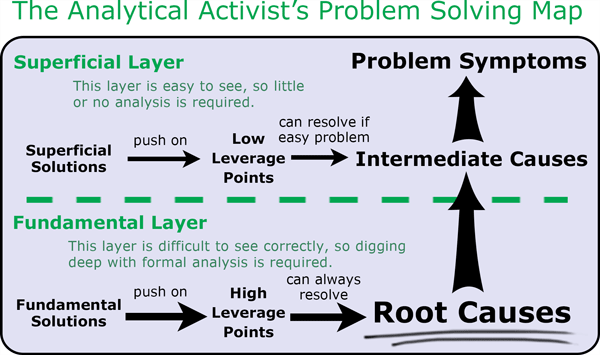 It's called superficial because it works on the superficial layer of the problem, as shown in the Problem Solving Map. Superficial solutions don't work because they do not resolve root causes. Due to reliance on Classic Activism, the environmental movement has been promoting superficial solutions ever since they started working on the sustainability problem. Classic Activism has no concept of root causes. Its practitioners are thus unable to tell intermediate causes from root causes. This causes them to be unable to tell superficial solutions from fundamental solutions. Since superficial solutions are several orders of magnitude easier to find, they are the norm. Superficial solutions are also called symptomatic solutions because try to solve the problem by treating the symptoms. They fail because that's like treating a patient's fever by plunging him into a bath of cold water. That won't work and may kill the patient. Much better and more sane is to perform a diganosis, also known as finding the root causes. [The second edition of The Limits to Growth] was published in 1992, the year of the global summit on environment and development in Rio de Janeiro. The advent of the summit seemed to prove that global society had decided to deal seriously with the important environmental problems. But we now know that humanity failed to achieve the goals of Rio. The Rio plus 10 conference in Johannesburg in 2002 produced even less; it was almost paralyzed by a variety of ideological and economic disputes, [due to] the efforts of those pursuing their narrow national, corporate, or individual self-interests. I come back to this quote often because it says so much. First it says we have failed to solve the problem. That's because environmentalists have been promoting superficial instead of fundamental solutions. It also says the reason is "it was almost paralyzed by...." That's a strong clue about why solution failure occurred. But are environmentalists following that clue up? Are they relentlessly analyzing the underlying change resistance that's causing such paralyzed decision making? Discussion and debate regarding reform of International Environmental Governance in the context of Global Governance for Sustainable Development has been ongoing. Over the past decade and since the World Summit on Sustainable Development in 2002, little progress has been made in relation to the required institutional architecture that would propel global environmental and sustainable development issues into the 21st century. Whilst the World Summit on Sustainable Development heralded a new era of action-orientated 'partnerships' for sustainable development, it is recognized that despite the considerable success of some of these partnership programmes, they have not delivered the systemic change needed in global governance to deliver sustainable development. It is therefore hoped that the focus on 'the institutional architecture for sustainable development' for Rio+20 presents an unprecedented opportunity to spur progress towards a more effective global system for delivering sustainable development objectives. 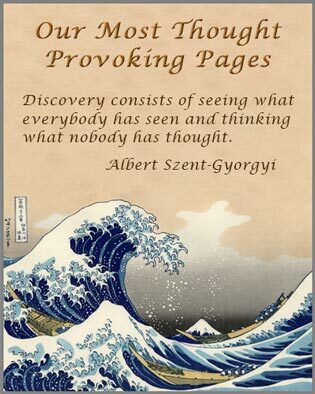 There is no trace of real analysis here or in supporting pages and documents. This is the intuitive problem solving of Classic Activism. At least the summit planners have admitted past solutions have failed. They're doing that to inspire attendees to do better this time, as they tried last time in 2002. Note however they have not identified the failure type. It's successful change resistance. 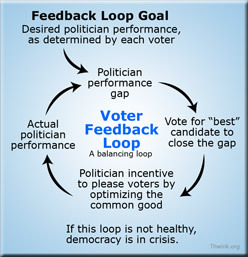 That's why past solutions "have not delivered the systemic change needed." The new proposed solution is to "focus on the institutional architecture for sustainable development." That's a superficial solution because institutional architecture is not a root cause. It's a solution management mechanism. The solution itself, sustainable development, has not been changed at all. Thus the Rio 2010 planners are telling us that the reason past solutions failed is poor solution management. This is clearly false, once you've analyzed the problem. The reason past solutions failed is successful change resistance. It's thus safe to predict that Rio 2010 will produce nothing but more superficial solutions. The alternative to superficial solutions is fundamental solutions. See this glossary entry for a list of popular solutions. They are all superficial solutions.